Godere di tutti i grandi ristoranti di Bristol, bar e paesaggio storico dal nostro appartamento nel centro di Bristol. Appartamento 2 camera da letto che ha anche uno studio separato con un divano letto. 1 bagno, recentemente ristrutturato appartamento al primo piano. Situato nel centro di Bristol, a solo 1 isolato da Bristol Harbor e l'inizio della pista ciclabile. L'appartamento è stato completamente ristrutturato nel inverno del 2016 in stile nautico del New England. Tutti gli arredi sono di fascia alta (per lo più Pottery Barn). C'è un grande giardino aperto nel cortile di casa con tavoli e sedie per gli ospiti. This first floor apartment was perfect for our RI getaway. Spacious, clean, nicely appointed and perfectly located. Only two blocks from the bay and within walking distance to everything you need. The garden was a delightful space for morning coffee and to unwind after a day sailing, shopping or at the beach (Newport beaches were a short drive away). Ellen was very nice and easy to work with. This charming apartment was perfect for our weekend stay in Bristol, RI. Our extended family was in town for a weekend wedding and stayed in two of the three apartments in the building. There is more than enough room for 5 comfortably in each unit. Location is on a quiet residential street with unrestricted parking available. An added bonus is a nice backyard with a BBQ grill. 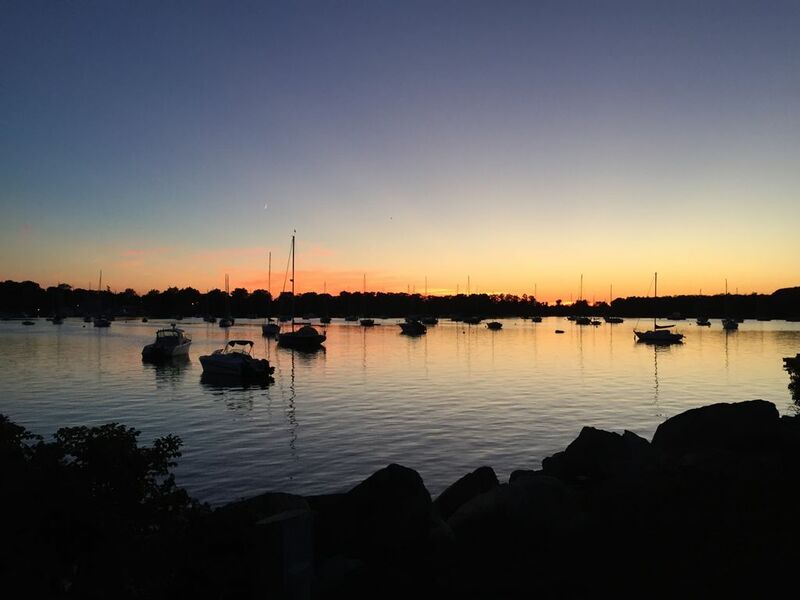 Historical downtown Bristol is only a few blocks away, and the waterfront is at the end of the road for watching beautiful sunsets. Lots of great restaurants, shopping, and sites to enjoy just steps away. This quaint New England seaport is near Newport and several wineries. Marc & Ellen are super hosts and provided everything we needed to make our stay comfortable, they are easy to contact if you have any questions prior to and during your stay. I would highly recommend this rental. Good Location 2 blocks from the water. Everything went to plan and we never even needed to communicate with the owner from check in through check out. We had a lovely time staying at this home in Bristol. The backyard is beautiful, with plenty of spaces for friends to sit together, or for one or two to nap in the hammock. The home is lovely and clean, with a living room ideal for sitting around and catching up with friends. We enjoyed walking from the home along the water and through Bristol to nearby restaurants and cafes. The hosts were very kind and responsive to our communication. I'd happily recommend this home to travelers looking for a cozy spot in Bristol. Perfect for a family wknd away! This was just the perfect place for a low-key weekend in Bristol attending a family wedding. It was just the right size for a family of 4 (1 couple and 2 adults, though we could have comfortably done 2 couples and 1 single adult). It's very quaint on the inside and an easy, convenient walk to all things downtown (just a hop, skip, and a jump to the waterfront). There were mini shampoos under the sink like a hotel, a hairdryer too, coffee for the coffeemaker, plenty of towels... truly, our needs were more than met here! Adorable, clean, great location, awesome owners! This place is overall a perfect spot for a stay in Bristol. I got married on a Saturday in Bristol and stayed there Wed-Sunday. The place had a great amount of space to prepare, have bridesmaids over to get ready, etc. The owners even asked if we wanted an extra AC and installed it right then and there. They totally want their visitors to have a great experience and to enjoy Bristol as much as they do. The place is also nicely decorated and comfortable. Plenty of places to sit and relax with a group of people. I highly recommend!